If you think your foster pet is having a medical emergency, follow the procedures below. Business hours are 8:30 a.m.- 4:30 p.m. seven days a week. If you do not reach us at the number above, leave a detailed voicemail. The Emergency Foster Hotline above is to be used only for off-hour emergencies: Before 8 a.m. and after 5 p.m.
Leave a message detailing your concern, the animal’s name, your name and a callback number. A staff member from PAWS Chicago will return your call within 10 minutes. We need those 10 minutes to familiarize ourselves with the animal’s medical condition and current treatment plan before we can advise you of the best course of action. Please do not proceed to any veterinary hospital unless you are authorized to do so. If you go without our consent, you will be responsible for any charges incurred. Email us foster@pawschicago.org the morning after an emergency. We want to know how your foster pet is doing! 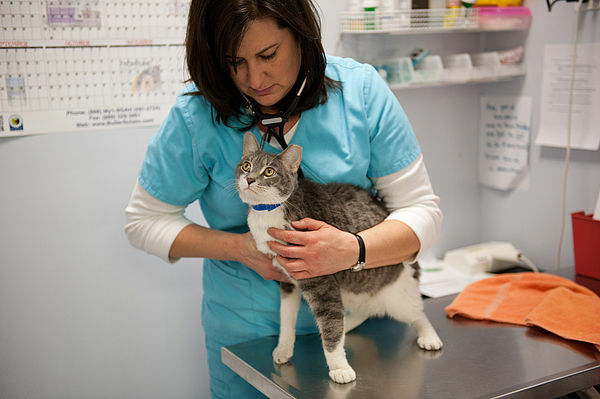 Not sure if your foster pet is showing signs of a medical emergency? Please refer to the Dog Signs of Medical Emergency and Cat Signs of Medical Emergency for more information.